100 years Zeppelin, but . 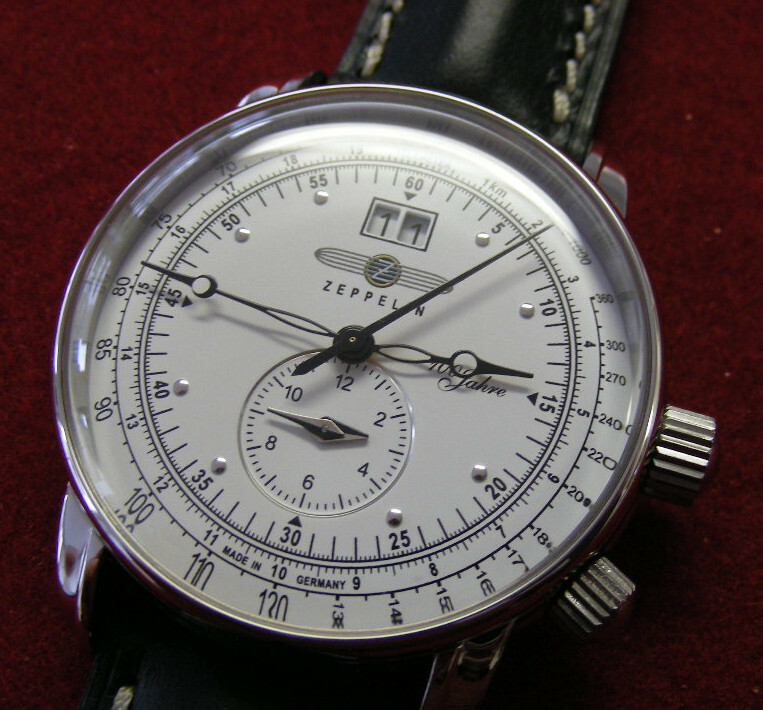 . .
Having a soft spot for German watches, this one from Zeppelin should be a really nice addition to anyone’s wrist, but note I say “should”, as I have reservations. 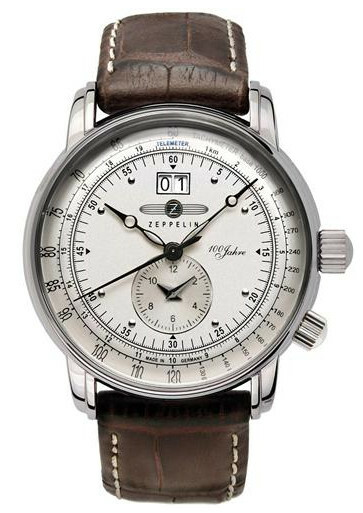 The Zeppelin Men’s 100 Years Zeppelin Dual Time Brown Leather Strap Watch – 7640-1 is certainly one of the most handsome models around that doesn’t break the bank at under £150 discounted. The classic dial has a Big Date window @12 and a Dual Time sub-dial @6 which is freely adjustable. It’s powered by the excellent Swiss analog Quartz Ronda 6203.B Normtech jeweled movement with a specified 40 months battery life. The silver colored dial has in contrast black steel hour, minute and center seconds hands and dot markers with the tachometer figuring look good and about as traditional as you can get. I thought when I first saw it that the well shaped hour and minute hands had luminous infills, but to my dismay these are simply skeletal and even the markers are silvered dots, so it appears there’s no luminous anything on this watch face and that’s disappointing. The case is a nice hand finished Stainless Steel and at 42mm diameter and only 11mm in height it’s well proportioned and yet, here again it is, perhaps marginally, let down by what is a relatively modest Water Resistance of just 5ATM. 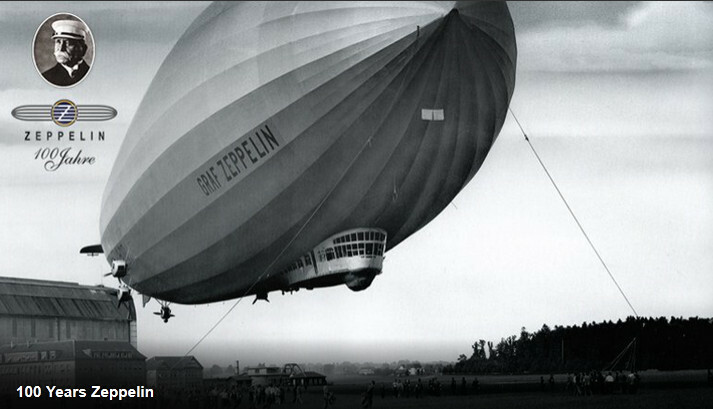 I mean for me the whole concept of Zeppelins and aircraft and scenes of these great Zeppelins hanging in the night sky and flying, and all that entails, surely means practicality and being able to see in the dark is one element that to my mind is absolutely essential. So to have what I would consider a must have functionality missing, is a great disappointment. Indeed it’s stopped me from adding this model to my affordable collection, which is a shame as I was looking forward to enjoying it. But hey, that’s life and one thing I have found over the years is that when it comes to watches, it’s always tricky to get just what you want. It does show that you should be careful when checking images on the internet. It’s very easy to assume that the hour and minute hands in this second image are luminous infilled – and they’re not. The first image is much clearer and shows the true picture. The trouble with complications is that once you have these squeezed into a watch, there are usually two distinct problems. The first is Size and the second is user friendliness. 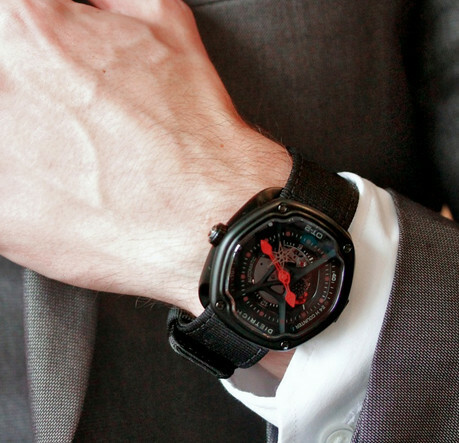 Regarding the first problem – often the watch is physically just too big, the lug to lug distance resulting in overhanging the average wrist so much that it simply doesn’t fit the average wrist at all. An excessive diameter measurement even though large, might be acceptable, but coupled it with a large Height or thickness, the entire watch becomes unwieldy and looks pretty silly if we’re being honest. The second problem of User friendliness or ease of use is another matter and a direct result of the added complications factor. How does the Manufacturer enable all these extra functions without having more buttons, pushers and so on and expect the user to remember what on earth to do, to action a particular function. Do the instructions make sense, easy to follow and above all are they intuitive? A for instance is this Casio GA-1000- 1AEF model that has a respectable functionality with analog hands showing the time, plus a digital set up that also can show the time (not linked) and also a Timer, Chronograph, Alarms, World Time, Thermometer and a Digital Compass for good measure. It now becomes complicated and it doesn’t have Solar which is a pity as the Solar function doesn’t require any input from the user at all! It has 4 pushers plus a large Compass pusher too but no crown. To adjust the analog time takes a fair old bit of push buttoning (is there such a phrase? )and digital sequence of events and to get both digital time and analog time to agree is even trickier. And you might well have left the instructions at home – silly boy! Casio has however made compass calibration simpler? than usual, by using the 180º method, which means you only turn the watch 180º and the watch does the calibration automatically – sort of . . . . . and no I don’t understand it either! and I still need the instructions to remember how to manage it . 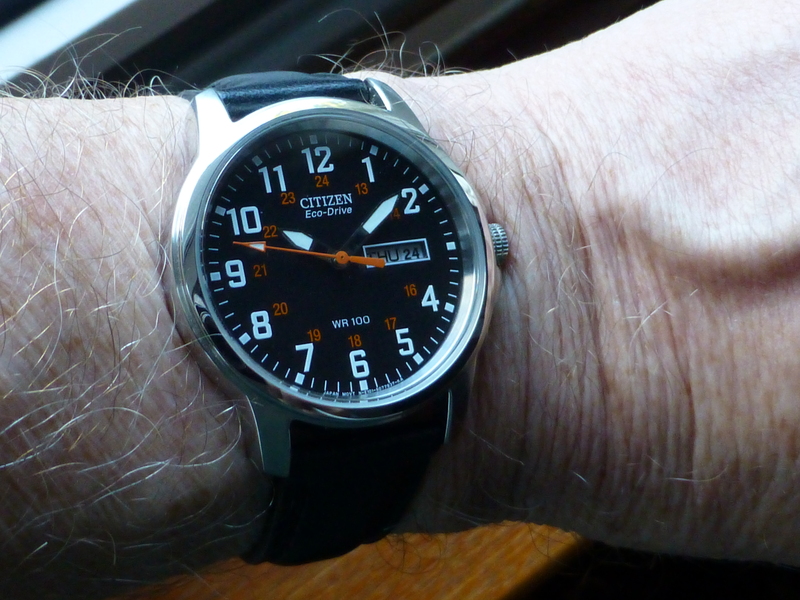 . .
One other thing to say about this watch – for a twin sensor model it is a brute and just far too big! Many models today maybe digital only and any and all adjustments are managed by a sequence of pushers and buttons and a good user memory. Add in an analogue function or two as in ana/digi models and there are more choices perhaps for the introduction of Crown usage – or not – in the case of some Radio Controlled models. With these why have a crown at all as the time should always be correct via the Radio Signals? There are some models however that have thankfully decided that even with Radio Control functionality, maybe a Crown is a darned good idea. It’s another and importantly a familiar control that users could certainly appreciate. The trouble was I wanted a model with a Digital Compass. Don’t ask why – I just did, perhaps the geek in me and funnily enough apart from making the watch very large the Compass is the easiest thing to work on the Casio GW1000 watch. Simply push the big button and Bob’s yer uncle! And I like the watch, but surely I thought there must be an alternative? Something sleeker, more user friendly and without frequent referral to that darned instruction booklet. However today I think I’ve found it at last! 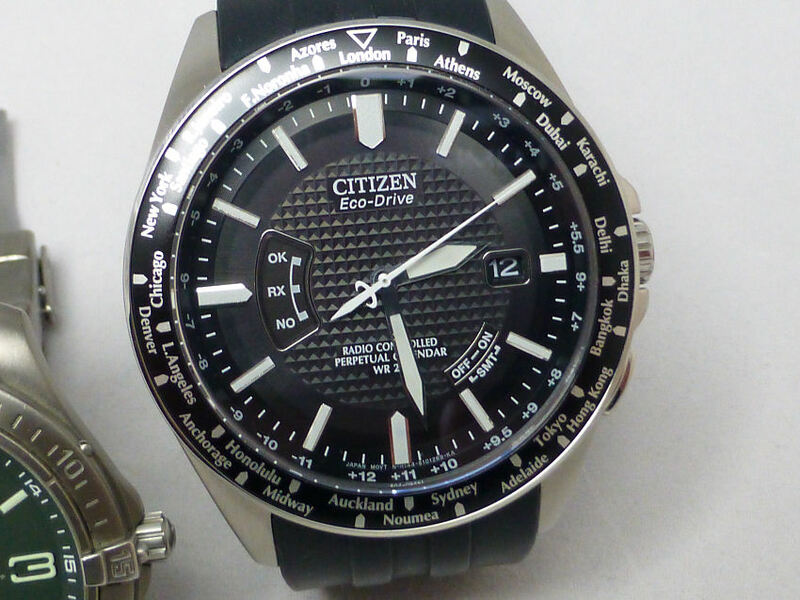 My Holy Grail – maybe . . . .
EQW-A1200B-1AJF Japan domestic version – RC, Solar, World Time AND Digital Compass. I introduce the EQW-A1200B-1AJF from Casio – and note this is a Japan domestic model and on the face of it – it looks a nice smooth watch. Doesn’t even look complicated. But it is . . . This model has not only the same functionality as my previous watch, but has additional ones, such as Radio Control and Solar Power. That means it’s always correct time wise and you forget about batteries. And yes this model also has a Digital Compass which is only noticeable because it says so on the dial! This is something I wasn’t expecting – a rather understated refinement and an almost elegant watch from Casio. Isn’t that nice . . . . 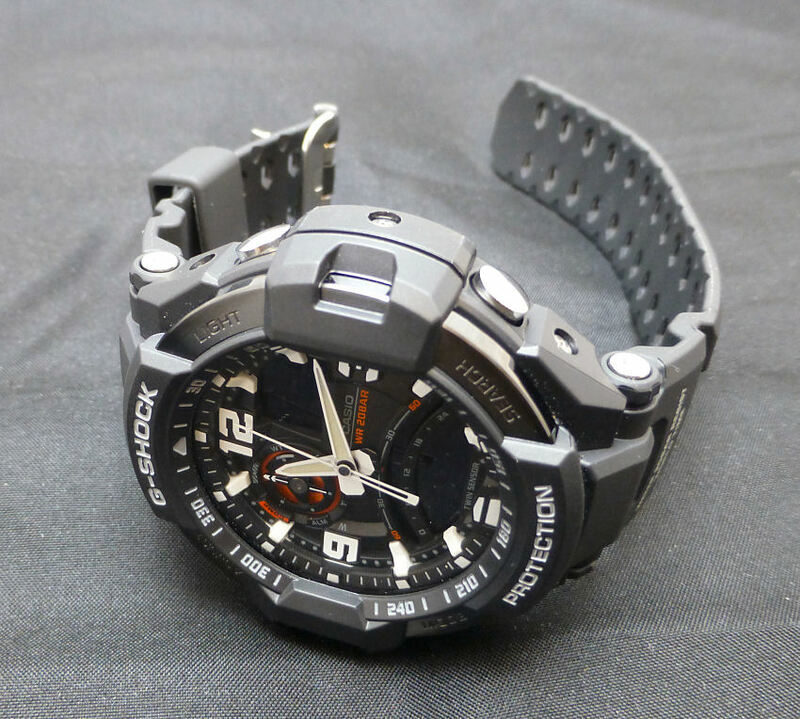 The watch dimensions are also rather good at 44.5mm diameter, a commendable lug to lug of just 52mm (I think my “G” shock above is something like 58mm) and a very slim and compact 12.8mm height. So very wearable for anybody – and about time I’d say! The dimensions are very encouraging indeed, so it appears the Size issue has been resolved here. What about the second issue – User friendliness. Important especially when you consider this model has not less but more complications than my big Casio – have they addressed this too? Slim model at only 12.8mm height – with a compass! Well things are looking good as this model doesn’t have a digital display and does have a Crown and that to me is a very good sign. Note too that it’s got just 3 pushers plus the Crown – so how will Casio manage with what appears to be less? 1) World Time and setting your own Home Time – this is as about as easy as it gets. Unscrew the Crown, then pull out the Crown. The Second hand will move and point to the City code the watch has been set to previously. Simply turn the Crown to move the Second hand around the city codes to the one you wish to set. Then push the Crown in – the hour and minute hands, perhaps the date and 24hr hands will move to reflect the time of that city. If OK screw the Crown back in – Job done! You can also swap Home and World cities and that’s easy too. 2) The lower dial – shows the mode the watch is set to – such as Timekeeping, World Time, Stopwatch, Countdown Timer, or Alarm. And note the same dial on Timekeeping points to the Day of the week. And also note that push button [C] (lower left) is the mode selector control so each press will cycle through the available modes. Note this dial also shows Receiving state and battery state too. 3) The Digital Compass – couldn’t be simpler as it has it’s own control at [A] push button (the buttons are lettered clockwise from [A] upper right). 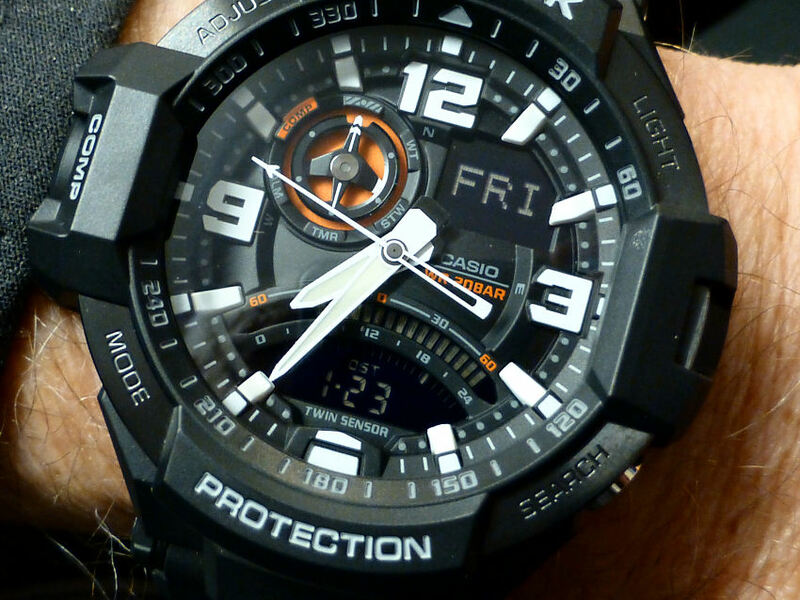 Unlike the digital display Casio GA1000 model this watch does not display any digital angular degrees. It is just like a standard North indicating compass. The bezel is fixed but does have some (sparse I’d have to say) degree markings on the inner blued ring which may be useful. So turning the watch around with Compass mode activated so that the North pointer lines up with the N on the bezel, then checking the bezel against your direction of travel and you’ve got some idea where you’re going. To use practically, I suppose the tried and tested “sit it on a map” alignment procedure is about as good as you’d get. 4) The Timer – this is up to 60 minutes only. Again use button [C] to select TR (Timer) on the lower dial. Unlock the Crown by screwing it out, then pull out and turn to set the Timer duration. In this operation the Minute hand will be the pointer – set it at 12 for 60 minutes and clockwise to any other time less than that. Press [A] to start. An Alarm will sound for 10 seconds on completion and button [B] will reset. A similar idea for the Chronograph operation, select via [C] and [A] to start and [B] to reset and so on – you’ll soon get the hang of it. And the Alarm is more of the same and here you can see the value of this Crown and in use a pattern is quickly established that you can remember – Select with [C]- set with the Crown – start with [A] and reset with [B]. Interesting lug/strap fixing to resin strap. Possible alternatives if required? maybe . . It all reminds me so much of my older Citizen analog Radio Controlled, Solar and World Timer model, which used the crown in exactly the same way, though a simpler and less complicated model of course. I love it and wear it often and I can see the same thing happening here even with all these complications. Other features are a very good night “Neobrite” illumination on hands and indices, good Water Resistance at 10BAR or 100m, Date, Day and Time continuous indication (always a good thing), a fully automatic Calendar to 2099, light weight steel and aluminum case & bezel resulting in a weight of only only 92gms. I’d say Casio might have just about got it perfect this time – though as always until you have it on your wrist for a week or so – you never know! I suppose “moving on” is about as good way to describe how Quartz technology has transformed watches of today from when I started collecting. I also belies just how fast this movement was and still is. I well remember a great quartz model I bought a considerable number of years ago that I thought was about as good as it got. which featured a more or less conventional set up, but sported Solar Power, a Day and Date display and great lume visibility in the dark and is still as good as it gets for what it does and amazingly still around in various guises today. I mean Solar Power simply transformed the thing into another realm. No more battery issues though not quite set and forget – allowing for the +/-15 secs/month accuracy of course, as the end of month date was still something you had to sort out. But that aside . . .
That end of month issue was eventually sorted out or bypassed by the introduction of digital displays – the module took care of the date as it was programmed to a date well in the future and probably longer than you would have the watch for. However as I like the traditional Day and Date window idea, technology today has come to the rescue again and even with mechanical disc Date windows, these can be what they call Perpetual Calendars – or until 2099 or some-such, so good news. Such as the Citizen AT World Time – image below. But that said with the introduction of digital displays and the newer hybrids showing both analog and digital displays things really took off. Just look at Casio, Citizen or Seiko, who between them probably account for the bulk of the watch quartz revolution and how their models have multiplied in sheer technological functionality. Not only do we now have Solar Power, we can add in World Timers, Chronographs, Alarms, thermometers and now ABC’s or Altimeters, Barometric Pressure, Forecasting and Digital Compasses. Citizen AT World Time – center crown control – so easy! Unfortunately there is always a down side and as I’ve said before, this is usually SIZE – yes to shoehorn all this technology into a watch is difficult and as a consequence watch sizes have got bigger. Whilst efforts are made with every new model to reduce module and sensor sizes. This adds another problem because they’re smaller. What happens can defeat the object. I can hear them already – “Wow, we can put even more into the watch” and so the watch size is still perhaps larger than ideal. Couple this with the incredible rise of “tough” watches or in the case of Casio, the “G” shock phenomenon, for that’s what it is. It is a fact that a quartz watch in a standard stainless steel case is already pretty tough, and be honest, probably tough enough for most of us. So a cult and fashion thing perhaps, but add this “tough” aspect of a physical case shroud to more functions, more sensors etc. that “tough” protection swells the watch size again and perhaps out of proportion. So we saw the rise of super tough models which were and are “macho” perhaps, but also were the models featuring all this “boys own” technology – and let’s face it, no matter how much fun, much of it is superfluous. So it’s refreshing to see the same Watch Brands addressing that issue in another way. Here they’ve taken much of this new technology and started incorporating it into more traditional looking watches. And without tough case shrouds the watch sizes reduced from diameters of 50mm+ back to 40’s and importantly slimmer too from 16mm down to 12mm or 13mm. It proved if nothing else that it was “Shock” watches that were and still the main culprit for the rise in watch sizes, and not actually the technology. 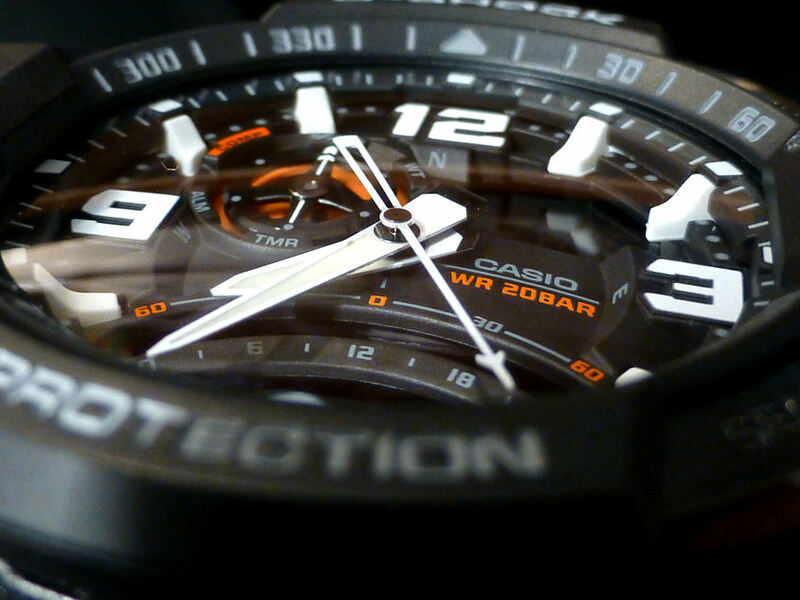 Which brings me to my latest model from Casio – The Casio Edifice EQW1200B-1AJF. It’s a conventional looking model with Solar Power, 44.5mm diameter and just 12.8mm height. It has World Time, Chronograph, Timers and Alarms plus a perpetual Calendar (till 2099) with a conventional style Date window and a Digital Compass, which is also relatively slim and sleek and for what it contains, definitely understated (similar crown control to the Citizen AT). 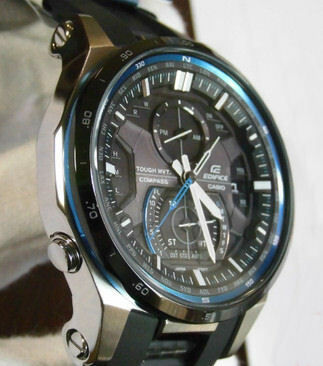 For more detail on the Edifice EQW model – see Part (2) next post. And here I think at last our Watch technology is finally fitting into it’s rightful place. A bit like the old Computers that used to fill an entire room and now you carry in your hand! 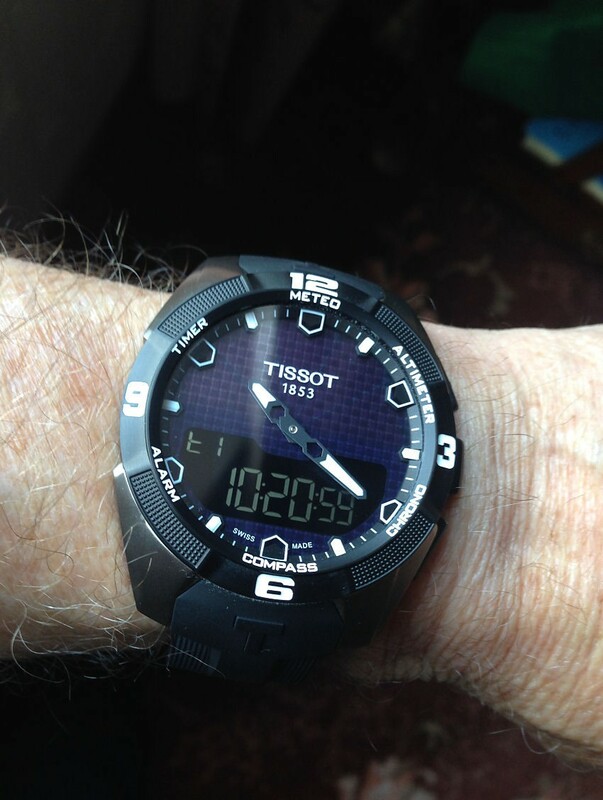 Tissot T-Touch Solar – hidden functions! 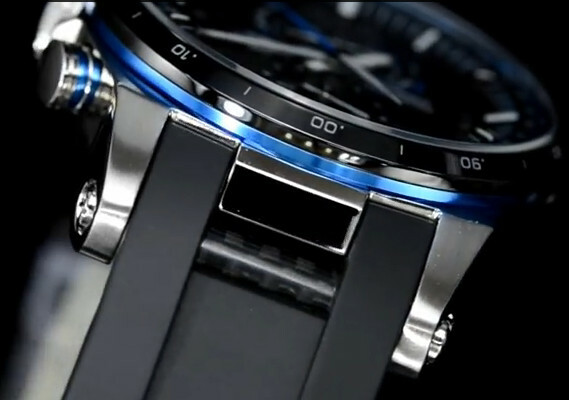 Here’s another non Shock but though not quite a conventional watch – the Tissot “Touch” Solar. Perhaps the ultimate ABC classic at the moment which has a similar functions but operationally unique, with Digital Compass, Barometric Pressure, Altitudes and weather forecasting, Chronograph, Timers, Alarms, Dual/Swap Local Time (what I call practical World Time – so many are a catalog of city codes) etc. – great luminous properties and night light and all in a very plain dial background. And that’s it’s particular secret – that dial is virtually empty and only shows what is selected and even the digital display hides away when not required. Once again an understatement if there ever was and yet hiding an amazing range of functionality. How much of all this stuff you would find useful is anyone’s guess and we’re all different of course, so for some a must have and for others – well like me. However I love the EQW Edifice here simply as it is so understated and the quite unexpected bonus of the Digital compass? Well I was a boy once and it just appeals . . . but importantly the core value functions are all there too and it doesn’t look like science fiction at all – but of course it is . . . it really is! Had this guy for a few months now and decided to update the experience so far. A BIG watch for me this Casio “G” Shock GA-1000-1AER from their G-Aviation series, but nevertheless a serious piece of kit with very little in the way of gimmickry I have to say. Might look cluttered – but not so! A quick glance and you know the time – whatever the light conditions. Not least because unusually it is NOT an ABC watch, though it looks like it – and it’s not Radio Controlled nor Solar powered model, though again it looks like it should be. This is a battery powered model, pure and simple. I understand this is the first watch in this series to have twin sensors. It also looks as if this big and bold dial should be cluttered – but it’s not and in fact is one of the easiest and clearest Casio “ana/digi combo” models I’ve seen that manages great analogue clarity and I mean “quick glance” stuff. A quick glance in any light conditions and you can instantly read the time without fail. The secret is in the detail of the dial construction, multi-layered with great white, almost 3D like indices and markers, in bright white plus great big hands for the analogue function, with plenty of luminous qualities to boot. The watch is also amazingly light weight, so big as it is, with the ultra thin silicon/resin strap and flat buckle arrangement it manages to fit even my average wrist at 170mm. Not a dress watch of course and not intended to be but it manages better than many surprisingly. 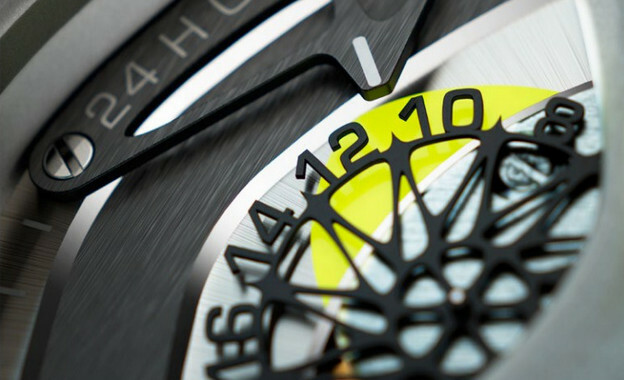 Multi-layered dial construction is the key to clarity. Big markers, big hands! And for night use, it’s pretty good and maybe one of Casio’s better efforts, which is also a real plus, as NOT being a dress watch, it could well be worn in situations where reading the time in the dark is exactly what you want. A slight issue perhaps is the fact the digital displays are not illuminated and whilst a negative point about which others have commented, it appears in their respective reviews no-one’s marked the watch down because of it. So I assume like me, they find as long as you can tell the time at night or in the dark, then that’s good enough. The interestingly figured Seconds hand doubles as the compass. That is the Digital Compass pointer – and in this respect it is excellent. The bright white arrow head pointer is cleverly counterbalanced by the long double split pivot overhang, so making this a very clear and easily read pointer for compass North. Nothing in the background distracts seeing the pointer at North, the digital upper window shows the general E,W S and North heading and the lower one the degrees of the watch head @12. Super simple and very clear to read (however if you need to use a compass at night, then this is not the best watch for you). For me it hardly matters as I rarely use compass much today anyway, but the other watch features – Alarm, Timer, chronograph and the really excellent World Timer all work fine and are easily used – and this is where the large dial seems justified somehow. It’s probably the biggest watch I have and I doubt I’ll ever get another this size, but it’s amazingly light, it works really well and I can easily read the time anytime, anywhere and once on the wrist it’s forgotten – until you need to know the time. So it’s a bit different, but the best part is simple – and I mean “simple” – it’s simple to read and amongst all that “apparent” dial clutter, it’s simple to tell the time – and that’s got to be good! So basically I’m pretty satisfied with this model, though in all honesty today I suppose there is one function that maybe I’d like to see added. Namely the watch needs to be Radio Controlled. I say this as to change the analogue hands to the correct time, if inaccuracy creeps in as it will, requires you to go through a push button sequence. You have to press button A (top left) until ADJ comes up, then use button D (lower left) to cycle through the options. You then get to the time options which will flash in turn and adjust accordingly, which of course is no great hardship, but is time consuming and you have to remember which buttons to use etc. IF it was simply a case of pulling out a center crown and adjusting the hands it wouldn’t be an issue at all, as there would be no trying to remember what to do. As I say a minor matter perhaps, but it should borne in mind when considering a model without the center crown controlling analogue indications. There will always be a digital sequence to go through to manage what should be a quick and simple operation. But I still like this big watch and I wear it quite often – and that’s usually proof of a good buy. My original feature is HERE for further information. Very different but also for the experience, something of pretty good value too. 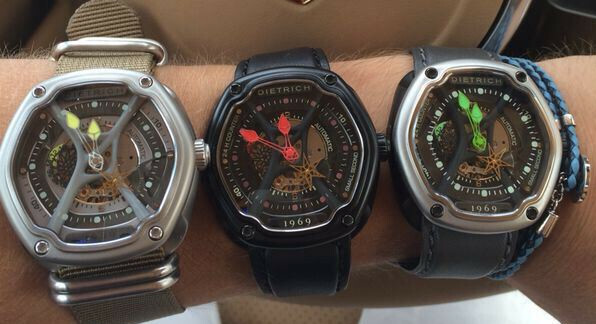 It’s the Dietrich OTC-A01 or the Organic Time Chronometer A model , version 02 and I think personally that it’s one of a very special breed that thinks it’s skeleton and yet still manages to be easily read. And that my friends is no easy feat believe me! The movement that is seen in part skeleton form is the enhanced Automatic mechanical Miyota 82S7 with the escapement visible in the dial and the time indication is by the wonderfully sculpted Hour and Minute hands in night bright luminescent Superluminova, a small seconds and 24 hour hand in addition. Note the amazing seconds indicator at 4 o’clock which is the hexagonal star shaped disk in a polished yellow gold tone that rotates continually which gives a wonderfully fascinating “automaton” mobile effect to the watch wearer. The case, frame are made of 316L Stainless Steel micro-bead blasted with black DLC coated bead blasted stainless polished bezel on top. The glass is Sapphire with anti-reflection coatings applied on the under surface along with the Superluminova coated indices. Note the interestingly sculpted case and strap arrangement – it works! The Water Resistance is a healthy 50m or 5ATM and the Crown is sealed with a double O-ring and the case back is an engraved screw back. Dimension wise it appears at fist glance to be quite large with a width of 49mm (including the crown), though this is tempered by a much smaller than anticipated lug to lug measurement of just 48mm. The height is also smaller than at first appearing at just 13.7mm, so a deceptive piece of construction in my view. 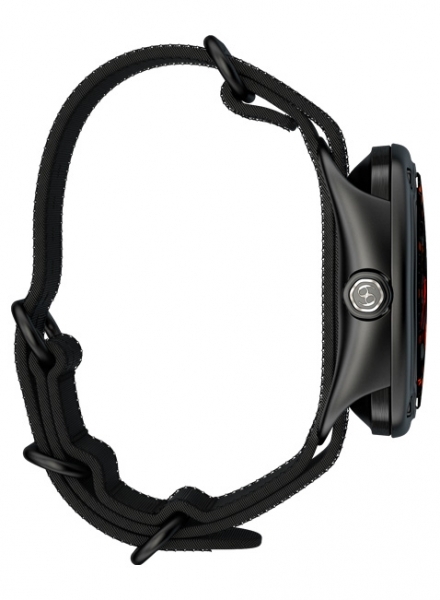 The strap is a NATO style nylon and there is also a carbon finish strap available as an option. The color scheme I selected here is the more subtle Red (02 model)as it comes with the dark finish case which I prefer. There is other more sudden color scheme (the 01) with bright fluorescent green being the most popular I understand. 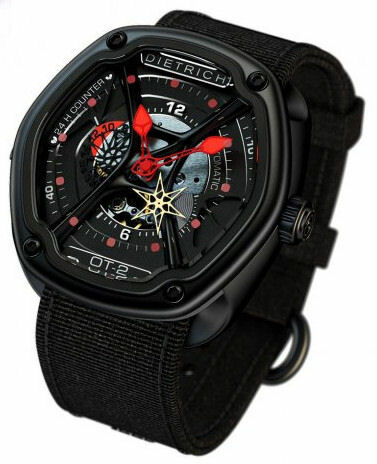 The dial of course is the most striking element of this model and has a unique 4 layered black dial, which allows the wearer to see everything and more, very easily. In fact as I alluded to in the first sentence, this watch only requires a “quick glance” to be able to tell the time quickly, something that some watches even with plain dials can’t seem to manage. And finally as I said, this watch is not as big as it first appears owing to it’s rather unique design with the underneath strap carrier being curved to the wrist and the top to bottom dimensions being to compact. Here you can see it fits rather well on the wrist and doesn’t look large at all. Perhaps something that other watch makers should look at, as they often have real trouble making a watch fit a normal wrist. Dietrich though have no such issues and it’s even more amazing when you consider the cost of this technical, individual and yes “organic” marvel is under, yes under £1000. I’ve got to get one – it’s as simple as that – it really is . . . . 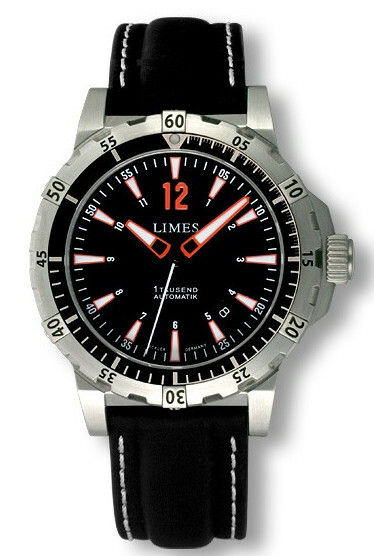 The German made Limes Endurance series of watches has been a favorite Divers/Sports watch for some time and here I feature the Neptune 1 model U8777-LA2.2. 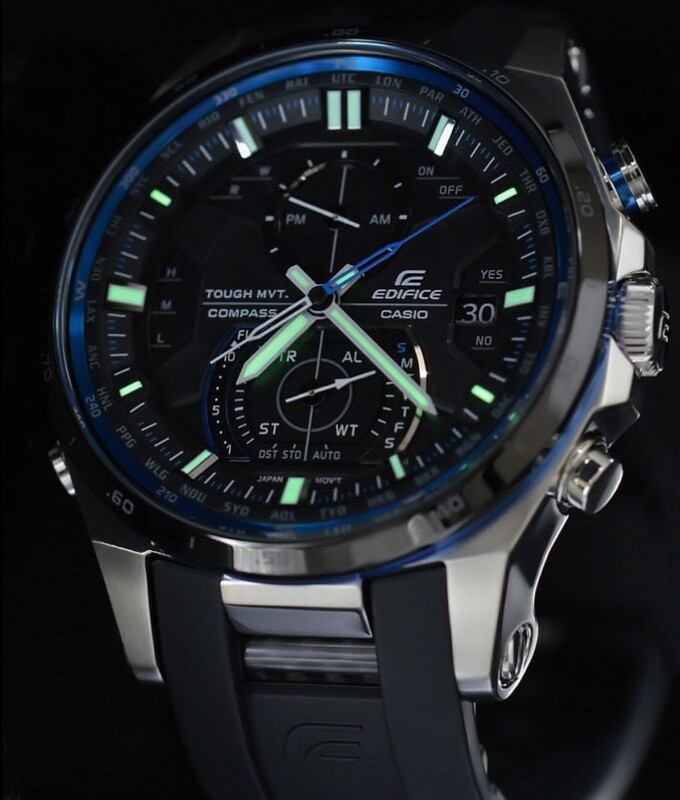 One of it’s main features of course is the fact that it is a 100atm Water Resistant stainless steel cased model – and that’s 1000m for those into figures. The second feature I like is the fact that it manages this incredible Water resistance with a case measuring only around 41mm diameter and just 12.6mm thick, so is also very wearable without being a large chunk of metal and on almost any sized wrist. A deceptively simple dial arrangement in black/white with orange luminous indices and white/orange luminous hour and minute hands plus a conservatively sized Date window between 4 and 5. Note there are quite a few scales within this dial, not obvious at first but useful. There are in this range other configurations of hand/indices colors and so on but basically they are quite similar. The well defined bezel is uni-directional and I particularly like the separate definition metal finish on the 10, 20, 30 ,40 50 and 60 bezel marks making for really good visibility. The large protected and easily gripped crown is of course a full a screw down type. Powered by the Sellita SW200 standard Automatic movement it is also therefore a very reliable and solid performer. This version comes with a good quality leather strap with contrasting stitching and stainless steel bracelets are also available. It’s another one of those rare watch models that looks so much larger than it actually is – not an easy feat in itself, which I personally think a subtle but no less valid sales point. The other good aspect of this range is the pricing, which for the Neptune 1 here is around €740 and you certainly get a great water resistance pretty unmatched by others at this size either and for me could easily end up as a “daily beater” with no worries about where it ends up. So yet another one of those German made watch models that you don’t see so often outside of Germany and perhaps the USA. Their web site is HERE. and well worth a look as they also produce the Pharo and Chyros series models which are quite different in looks and function. 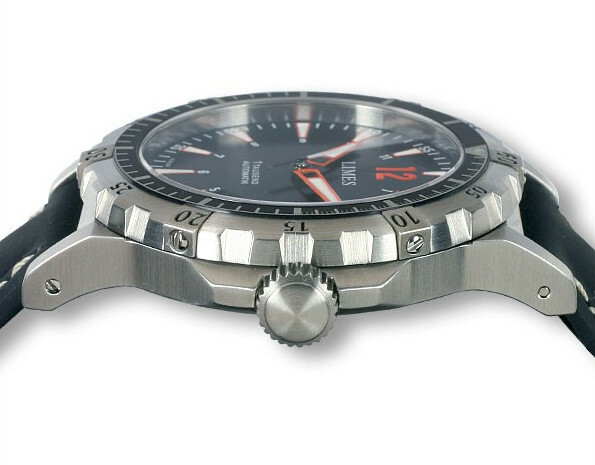 My favorite of the others is the Chyros 3 Hands/Date – Silvered / black leather strap – Ref. number: U6017-LA1.5 but that’s another story. 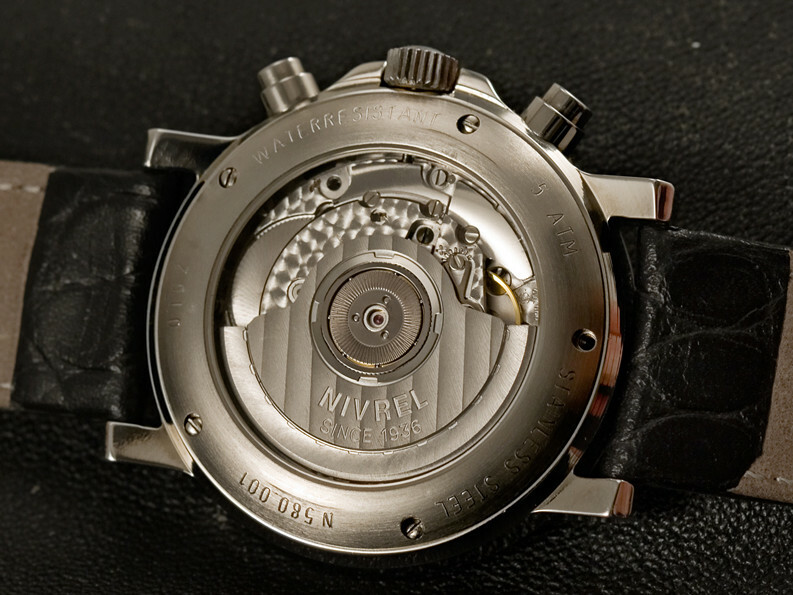 Another German Watch Company I’ve always had a soft spot for is NIVREL which is a registered trademark of Gerd Hofer GmbH, located in Saarbrucken, in Germany’s federal state Saarland. They have a neat range of watches that I personally like as they are out of the mainstream and have an individuality that personally appeals. Out of quite a few I like I’ve chosen this model – the Chrono Heritage Grand Date N 580.001 which is a little unusual in layout. ETA 2892-A2 belies a secret – an added Chronograph module with Month indicator. The movement is interesting as it appears through the exhibition back to be a non Chrono Automatic. The movement is recognized as the Swiss ETA 2892-A2, but interestingly here it is used purely as the base movement. 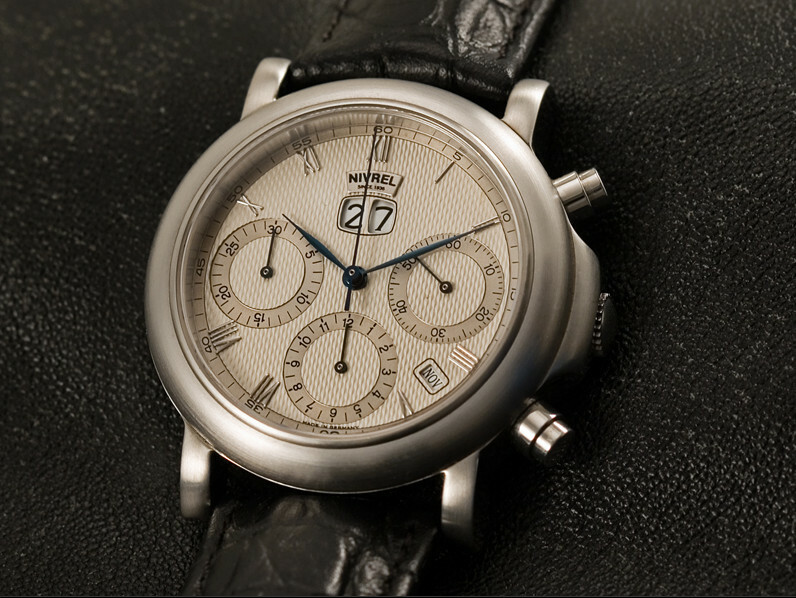 Then Nivrel with their design individuality showing strongly, decided to add their own complicated chronograph module, the effects of which can be seen in the dial configuration. As well as the obvious twin disc Big Date aperture @12 if you look closely there is another smaller window between 4 and 5 for a Month indication. The watch model is what is called a One-Year-or “Annual” Calendar and is adjusted just once per year on the 28th or 29th February. I personally find the dial layout intriguing and yet satisfying at the same time – and I rather like it as it’s just so unusual. The dial is silver-coated with Clous de Paris guilloche in German silver, rhodinated applied indexes and the 6 flame-blued steel hands set gives excellent readability under a Sapphire Crystal. Nivrel’s Big Date plus Month complication ETA. Note the discrete Month between 4 and 5 o’clock. The case is in 316 Stainless Steel with a nicely molded case crown protection swell (the crown is very well defined with a strong milled edge). 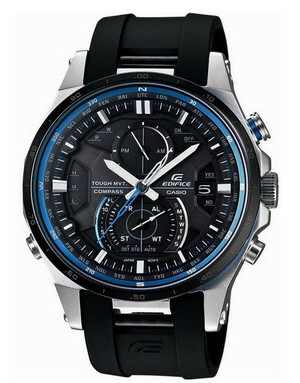 Water Resistance is 5 bar and the case diameter is just 38.2mm and at only 12.8mm depth is quite neat for an automatic Chronograph. A high quality leather strap with signed Nivrel buckle completes the ensemble. Overall this is a very neat and compact model and with it’s satin finish certainly does look the part. Additionally the short lugs arrangement allows this model to to fit almost any size wrist and is one of my favorites from the range. However it has to be said that there are other models in this NIVREL range that I also like very much, so rather spoilt for choice . . The NIVREL range can be seen HERE. I also featured a couple of Nivrel Calendar models HERE last February, which may be of interest.